Heritage Gardens is a gated 55+ community of new homes in Eagle, Idaho. Located in the highly coveted west Eagle area, this age-restricted neighborhood provides the luxurious lifestyle that active adult homebuyers expect. Enjoy finely crafted single and two-story homes with a spacious master suite and open living space perfect for entertaining. 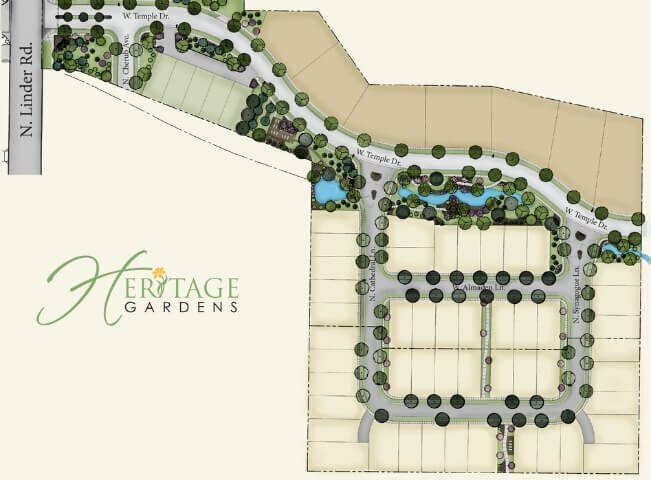 Choose your building lot and floor plan and make your new Heritage Gardens home your own. All lawn maintenance is taken care of, including snow removal, allowing residents to enjoy the great outdoors, large parks and walking paths within this beautiful community. Venture outside the neighborhood and discover dining, shopping, and entertainment just minutes away. Searching for new construction? Browse our vast selection of new homes in Eagle or explore our comprehensive guide to new Eagle subdivisions. Head West on Chinden Blvd from Eagle Rd. Turn right (north) on N Linder Rd then right (east) on W Temple Dr, Eagle, ID 83646. To schedule your personal tour or learn more about the gorgeous new homes at Heritage Gardens, contact us online or call (208) 391-4466 today.